After thirty years, Wilson Lewis is forced to face a painful truth: the romance has gone out of his marriage. His wife, Jane, has fallen out of love with him, and it is entirely his fault. Despite the shining example of his in-laws, Noah and Allie Calhoun, and their fifty-year love affair (originally recounted in The Notebook), Wilson himself is a man unable to express his true feelings. He has spent too little time at home and too much at the office, leaving the responsibility of raising their children to Jane. Now his daughter is about to marry, and his wife is thinking about leaving him. But if Wilson is sure of anything, it is this: His love for Jane has only grown over the years, and he will do everything he can to save their marriage. With the memories of Noah and Allie’s inspiring life together as his guide, he vows to find a way to make his wife fall in love with him…all over again. If you’re a regular reader of my blog, you will know that The Notebook by Nicholas Sparks is one of my favourite books ever. It tells the story of how Noah and Allie fell in love one summer, lost touch for 14 years and then found each other again. Their love story is truly inspirational and touching, and, despite all the hardships they had to face, they still managed to keep the magic in their relationship alive. Things, instead, turned out differently for their daughter Jane and her husband Wilson, whose story is told in the Wedding, the long-awaited follow-up to The Notebook. Wilson couldn’t be more different from Jane’s romantic father Noah. He’s not the romantic type, he’s no good at expressing his feelings and worked so much during all the years of their marriage that, as a result, he and Jane have fallen apart. But despite all this, he’s still madly in love with her. Unfortunately he realises that she doesn’t feel the same way about him anymore. So he decides to win her love back and turns to Noah for advice. He wants to do something special for their 30th anniversary but a couple of weeks before that date, their daughter Anna announces she’s getting married. She wants a small, no-fuss wedding and Jane, who has never had the white wedding she desired because her husband, not believing in God, convinced her to have only a civil ceremony, organizes it. Anyone who’s been in a relationship that’s lost its magic (and let’s face, who hasn’t?) will relate to Wilson and Jane’s story. They are two ordinary people; there is nothing remarkable about them that makes them stand out, and in a way, this makes them quite boring characters, but it also makes them real. Jane and Wilson could be absolutely anyone and to see the way he goes about to fix their marriage is very touching. And the end will absolutely surprise you. Although the book is a bit sappy, it also offers some interesting food for thought and makes you reflect on how a stale marriage can be saved if both parties are willing to work hard at it, instead than just giving up. The book is not as engaging as The Notebook and quite slow, especially at the beginning. A large chunk of the book is also dedicated to the wedding arrangements, which some may found boring, but I really enjoyed it. The writing style is just poetic. Sparks really has a way with words that tugs at your heartstrings and, if you’re the romantic type, this book will make you shed a tear or two. Overall, The Wedding is a well-written, romantic, and even sappy story, that will make you smile, cry and think. 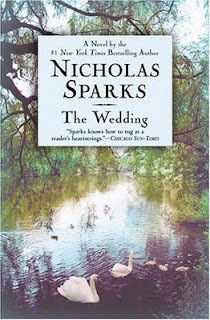 The Wedding by Nicholas Sparks, tells the story of how an ordinary man, who has neglected his wife and finds it hard to show her how he feels, fights to save his stale marriage. It is a story that anyone can relate to and provides some food for thought. Although the story is a bit slow, especially at the beginning, it is still well-written. Nicholas Sparks has a way with words that makes even the most ordinary story seem unique and poetic.